There isn’t much optimism surrounding the Pitt football team after the Panthers fell to North Carolina, 34-31, in their last game. That loss, which gave the woeful Tar Heels their first ACC win of the year, brought the Panthers’ season record to 4-6 overall and 2-4 in the ACC. And with a formidable Virginia Tech (7-3 overall, 3-3 ACC) up next on the schedule, Pitt is in serious jeopardy of snapping its bowl streak of nine consecutive seasons. Pitt will travel to Blacksburg, Virginia, Saturday to face the Hokies on their home turf. That already puts the Panthers at a disadvantage — of the team’s four wins, just one has come on the road. The Panthers will face a Virginia Tech team that started the season 7-1 and reached its highest spot at No. 13 in the national rankings, but has since slowed its momentum. Back-to-back losses to Miami and Georgia Tech bounced the Hokies from the top 25 and ended their brief flirtation with national relevance. Virginia Tech may enter this game riding a two-game losing streak, but this is one of the best teams in the ACC. Pitt will have a hard time finding the end zone against the Hokies’ sixth-ranked defense, which limits opponents to just 14.8 points per game. On offense, Virginia Tech boasts a well-balanced attack that ranks in the top half nationally for both passing — 49th with 248.2 yards per game — and rushing — 64th with 164.7 yards per game. The Hokies also possess an impressive receiver in senior Cam Phillips, whose 60 receptions and 801 receiving yards are both top 30 in college football. Expect Phillips to shine on Virginia Tech’s senior day when he faces off against Pitt’s abysmal, 111th-ranked pass defense. Punts aren’t typically an entertaining part of the game, but that may not hold true for this matchup, which will feature two of the nation’s best return men. Pitt junior receiver Quadree Henderson and VT senior cornerback Greg Stroman have each returned two punts for touchdowns this season, which ties them for second in the nation. While both teams have talent in the return game, their quarterbacks don’t perform at the same level. Virginia Tech has a promising young signal-caller in redshirt freshman Josh Jackson, who has thrown for 2,382 yards and 17 touchdowns this season. Pitt redshirt sophomore quarterback Ben DiNucci has played in fewer games than Jackson, but his current passing stats of 1,037 yards and a mere four touchdowns aren’t exactly impressive. Despite the Panthers’ porous defense and lackluster passing game, there remains one glimmer of hope that Pitt fans can be excited about — junior running back Darrin Hall. 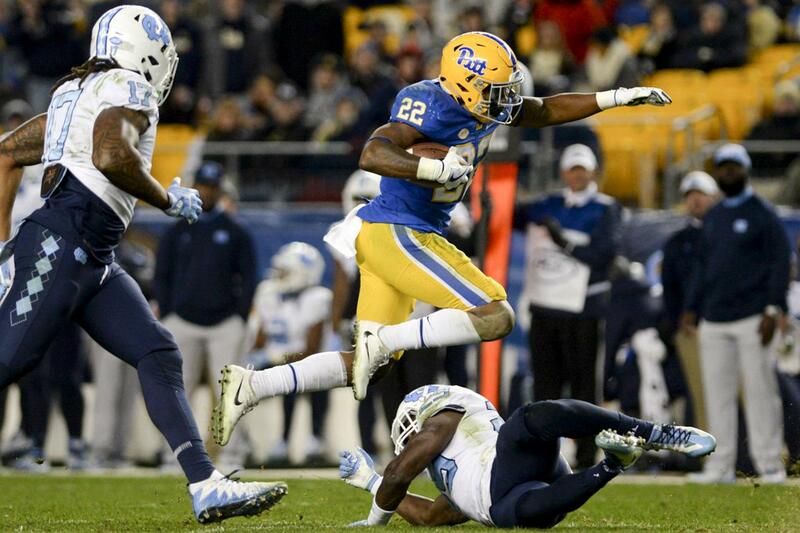 In the three games since Hall emerged as the Panthers’ go-to running back in week eight, Pitt’s rushing attack has leapt from 114th at 113.7 yards per game to 73rd at 157.5 yards per game. Hall has racked up eight touchdowns and 486 yards rushing over that span as well. But football is a team sport, and one standout player will not be enough to beat a team as strong as Virginia Tech. If the Panthers get down early, they’ll struggle to mount quick scoring drives behind the arm of DiNucci, who has surpassed 170 yards passing just once this season. If recent history is any indicator, Pitt will at least keep the game close. The last three games in the series have been decided by a combined 12 points. The results have been 21-16 Pitt, 17-13 Pitt and 39-36 Virginia Tech since 2014. PREDICTION: Hall will receive his usual 20-plus carries and look to break off big runs as he did against Duke, when he ran for 254 yards and three touchdowns. The explosive Henderson will also try to make the most of his limited touches, but the Panthers’ efforts will ultimately not be enough. Virginia Tech’s top-notch defense will limit damage control while Jackson torches Pitt through the air for multiple scores en route to a victory, ending the Panthers’ bowl hopes.